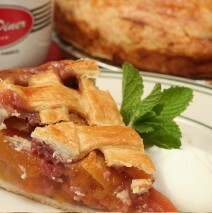 Our pastry cook always bakes one or two different fruit pies daily. Some are: sour cherry, apple, apple cranberry, triple berry peach and seasonally — pumpkin and local pear. Whole pies can be ordered ahead. In season we use the local organic fruits. Ask for it warmed with Haagen-Dazs ice cream – feels like grandma’s kitchen!